In Sekiro hard mode is not to be trifled with. But if you find yourself sighing discontentedly while easily taking down Swordsmen and perhaps even the Guardian Ape, then you’re in the right place, as there is a way to make Sekiro even harder. It’s a bit of a mission to do, but you’re no stranger to dedication and perseverance if you’re reading this. 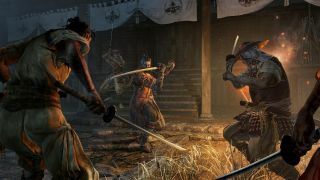 So here’s how to enable Sekiro hard mode, and don’t say we didn’t warn you about how damned difficult it is. First you’ll need to have the Bell Demon in your inventory, which makes you become affected by the Sinister Burden. That Burden makes fighting way more difficult, but as a bonus you get increased rewards from every foe you dismember/stab/eviscerate with your blade. You get the Bell Demon from - surprise surprise - the Bell Demon Shrine, which you can find in the Ashina Outskirts (before you go into the canyon and meet the huge white snake there). Once you get to the Sculptor Idol in the Underbridge Valley, turn around and go back towards Ashina Outskirts, making sure that you stay to the left of the fortress wall, and eventually you’ll get to a shrine on a wooden platform. Make sure it has a note on it warning you about some upcoming danger, then go behind the shrine. Keep an eye out for a ledge on the cliff you’re facing, then leap towards it and carefully move around the cliff until you reach a cave below. This cave can be a bit tricky, as there’s an enemy called Headless waiting inside it that you’re going to find is very hard to kill (and almost impossible during the early stages of the game). Reach the room Headless is in, then keep to the left wall and watch out for a path leading away from the room. Follow it, and at the end you’ll find a door that opens up onto a track that will take you to the Bell Demon’s Shrine. Just ring the bell and you’ll find the Bell Demon. Now things are incredibly hard, but that’s what you wanted, right? If you find yourself having second thoughts, all you have to do is use the Bell Demon in your inventory, and the difficulty will revert back to normal. If you’re after some more Sekiro: Shadows Die Twice goodness, here’s someone who beat it in under an hour, or look below to see what we thought of it!